The towering Monserrate Mountain with an elevation of 3152 meters is an important ecological and religious symbol of Bogota. There is a 17th-century church on the top devoted to El Senor Caido or “The Fallen Lord”. The mountain, Apart from being a pilgrim site, the summit also offers eateries, cafeteria, souvenir shops as well as many tourist facilities. The pilgrims prefer to climb the summit to reach the shrine on top. However, there are Cable Car and Funicular services available at the mountain. The neighbouring Guadalupe Hill also compliments the picturesque landscape of the mountain. From the top, if you face west, you can see the panoramic views of the South Bogota, some sections of North Bogota, the Guadalupe and of course, the ethereal sunset. 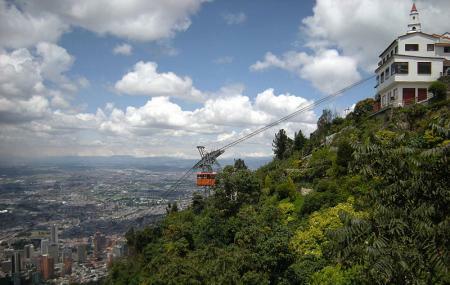 Try the best Bogota trip planner to visit this Monserrate as well as many others. Oomph up your visit by adding the best hotels in Bogota like Hotel Confort 80 Castellana, Hotel Casa Lozada and Hotel Excelsior. Curated Bogota vacation packages await! Book the best ones and start turning your dream into reality.Discover various ways for how to reach Bogota and complete the booking by choosing your mode of transport. People normally club together Plaza De Mercado De Paloquemao and Bogotá Botanical Garden while planning their visit to Monserrate. Breathtaking views of the city! It’s amazing to have such a gorgeous natural feature in such a big city. Travel tips: - Sunday is probably the worst day to go. There is a (beautiful) church at the top and since most of the locals are Catholic, they go up there as well. It’s okay, just be prepared to fall in line for a long time. It’s still worth the wait. - You fall in line first to buy the ticket. You have 2 options (2 lines) - the tram which is the one we took and the train which looks scary, but might be fun! - Bring an umbrella in case it rains. Some vendors sell them too. - There is a line to go back down as well. So just be prepared to wait again. Very beautiful church on top. It is about 10 minutes in the cable car or train and you are transported from 2600 meters to 3170 meters above sea level. The city on the one side and the mountains on the other with all greenery surrounding them. It gets very cold in the evenings and the air is thin. The view of the city is well worth paying visit here. Restaurants are around and are worth a visit.